In the winter of 1700, charismatic rabbi Judah he-Hasid Segal arrived in Jerusalem from Poland with about 500 followers (some say as many as 1000). You can imagine the reaction, at a time when the entire Jewish population of Jerusalem was about 500 people. They were mystics who were intent on bringing the Messiah and some say believers in the false messiah, Shabbetai Zvi. Within a few days of their arrival the rabbi died, some say he was poisoned. His followers struggled without a leader but managed to build forty dwellings and a small synagogue in the Ashkenazic Compound. Then they began to build a larger synagogue, but between bribes to Ottoman authorities, unexpected construction costs and other financial burdens they exhausted their funds. They took loans from local Arabs to complete the project. When the loans were still outstanding in late 1720, the Arab lenders lost patience and the synagogue was burned down, some say that 40 Torah scrolls were destroyed in the fire. The Ashkenazi Jews were banished from the city and the synagogue was left in ruins and became known as the Hurva, the “Ruin of Rabbi Judah he-Hasid”. It took almost 100 years, in 1815, when Rabbi Menachem Mendel of Shklov, leader of the Tzfat Perushim, moved to Jerusalem with a group of followers, disciples of the Vilna Gaon. They wanted to reclaim the Ashkenazic Compound and to rebuild the Hurva synagogue, which had symbolized the expulsion of Ashkenazi Jews from Jerusalem. They believed that the “repairing” of an earlier destruction would have kabbalistic significance and be a prerequisite for bringing the Messiah. There were a lot of difficulties in getting a firman, permission from the Turkish authorities to rebuild the Hurva. In 1829 Shlomo Zalman Zoref, a Lithuanian-born silversmith tried unsuccessfully but in 1836 he finally got a firman. Some say that it did not include permission for a synagogue in the Ashkenazic Compound but only for dwellings in the area. They managed to build two small synagogues. Although there was an injunction which absolved the Ashkenazim from repaying the debt and the Turkish Statute of Limitations cancelled out the debts of Judah he-Hasid’s followers Arab creditors interfered with the work and Zoref had to appease them with annual bribes. In 1851, Zoref was struck on the head with a sword and three months later died of his wounds. Be strong as the leopard and swift as the eagle, fleet as the deer and brave as the lion to do the will of your Father in Heaven. The Holy Ark had the capacity to house 50 Torah scrolls and was built on two levels. It was flanked by four Corinthian columns surrounded by Baroque woodcuts depicting flowers and birds. The Ark together with its ornamental gates were taken from the Nikolaijewsky Synagogue in Kherson, Russia, which had been used by Russian Jewish conscripts, forced to spend twenty-five years in the Czar’s army. The synagogue was dedicated in 1864 and called Beis Yaakov, in memory of Jacob Mayer de Rothschild but it continued to be referred to as the Hurva. It stood as a beacon above the walls of the Old City along with the dome of the Tiferet Israel synagogue. On May 25, 1948, during the fighting in the Old City Major Abdullah el Tell, commander of the Jordanian Legion, wrote to Otto Lehner of the Red Cross that unless the Haganah abandoned its positions in the Hurva synagogue and its adjoining courtyard, he would be forced to attack it. Moshe Russnak, commander of the Haganah in the Old City, ignored his request, knowing that if the Hurva fell, the Jewish Quarter would be lost. On May 27, el Tell, after receiving no reply, told his men to “Get the Hurva Synagogue by noon.” Fawzi el-Kutub executed the mission by placing a 200-litre barrel filled with explosives against the synagogue’s northern wall. The explosion resulted in a gaping hole through which the Legionnaires burst through. A short while later, after the Arabs had captured the area, another huge explosion reduced the 84 year old synagogue together with the Etz Chaim Yeshiva to ruins. The Tiferet Israel synagogue was also destroyed. Following the Six-Day War, plans were sought for a new synagogue to be built on the site, part of the overall rehabilitation of the Jewish Quarter. Leading the campaign to rebuild the Hurva was Zoref’s great-great-grandson, Ya’acov Salomon. He consulted Ram Karmi, one of Israel’s leading young architects, who magnanimously recommended Louis Kahn, a world-renowned architectֿ for the job. Kahn came to Israel to tour the site in the Jewish quarter and made a trip to the nearby Judean desert to visit two isolated Greek Orthodox monasteries, St George’s in Wadi Qelt and Mar Saba in the Kidron. 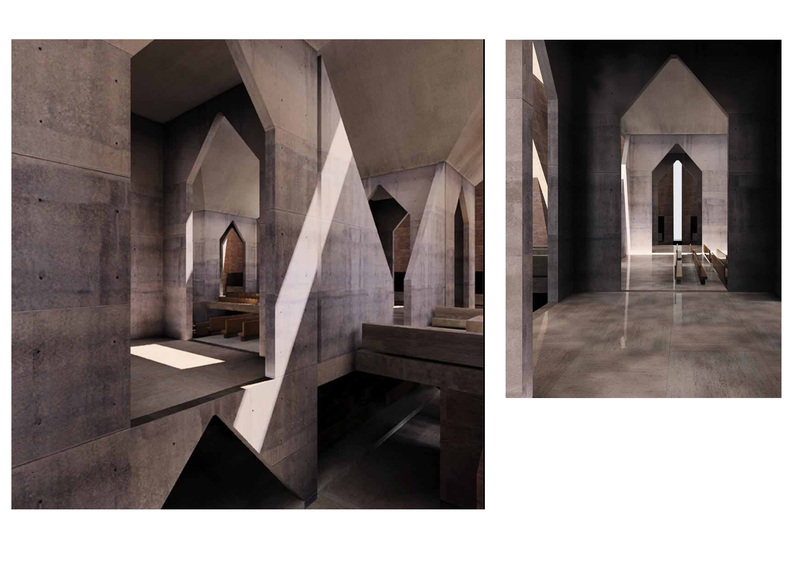 Kahn was deeply moved by the experience and inspired to design a synagogue that he felt expressed the spirit of Jerusalem, its history and religion. Between 1968 and 1973, Kahn presented three plans for the reconstruction. Each left the ruins of the Hurva in place as a memorial garden, with a new structure on an adjacent lot and a promenade, the “Route of the Prophets”, leading to the Western Wall. 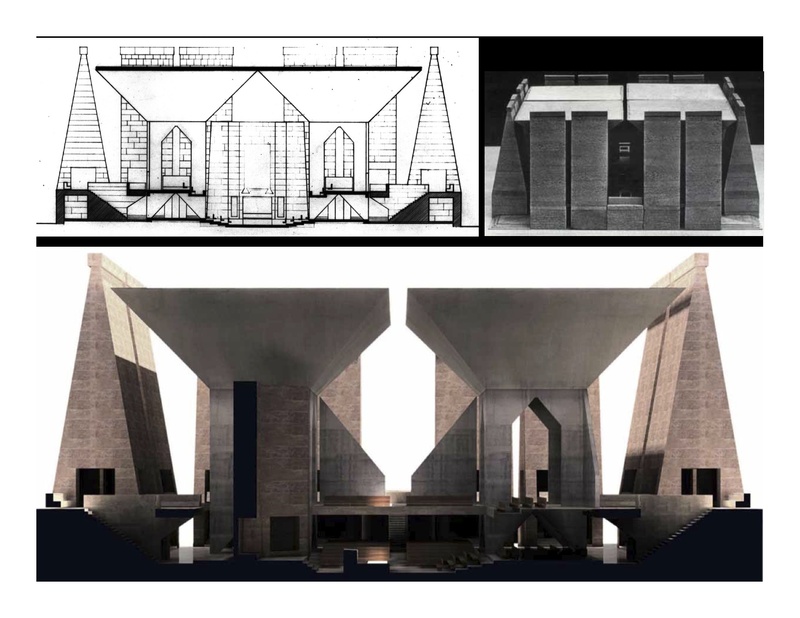 Kahn proposed a structure within a structure, the outer one composed of 16 piers covered in Jerusalem stone cut in blocks of the same proportions as the Herodian stones of the Western Wall. In the bases of the four corners of the two-story, 12 meter high structure would be small alcoves for meditation or individual prayer. The inner chamber, made of four inverted concrete pyramids supporting the building’s roof, would be used for larger communal prayer services. Unfortunately, Kahn died of a heart attack in the men’s washroom at Penn train station in New York City in 1974, a few weeks before he was to return to Jerusalem for consultations on what many regard as his greatest unrealized plan, the reconstruction of the Hurva synagogue. With Kahn’s passing his plans, through a combination of bureaucratic inaction and aesthetic timidity, died with him. Instead, in 2000 it was decided to rebuild the Hurva in its original 19th century Ottoman style. But Kahn’s plans haven’t been totally forgotten. In the mid-1990s, MIT architecture professor Kent Larson used Kahn’s plans and new modeling software to create dramatic color images of what the Hurva might have looked like, both from inside and out, complete with lighting and shadow. If such tools had existed when Kahn was living, it would have been clearer what a masterpiece we were being offered. Like the redevelopment of the World Trade Center site it raises broader questions about how to rebuild on a site defined in large part by a history of destruction. For most of its history the site housed a ruin and encapsulates not only the long conflict between Arabs and Jews in the Holy Land but also how we, Jews living in Israel, commemorate our past and envision our future. Contact me about a guided tour like Kahn’s starting with a visit to St George and Mar Saba monasteries in the Judean desert and then an overview of the Old City and the story of the fall of the Jewish quarter, its destruction in 1948 and rebirth after the Six Day War. 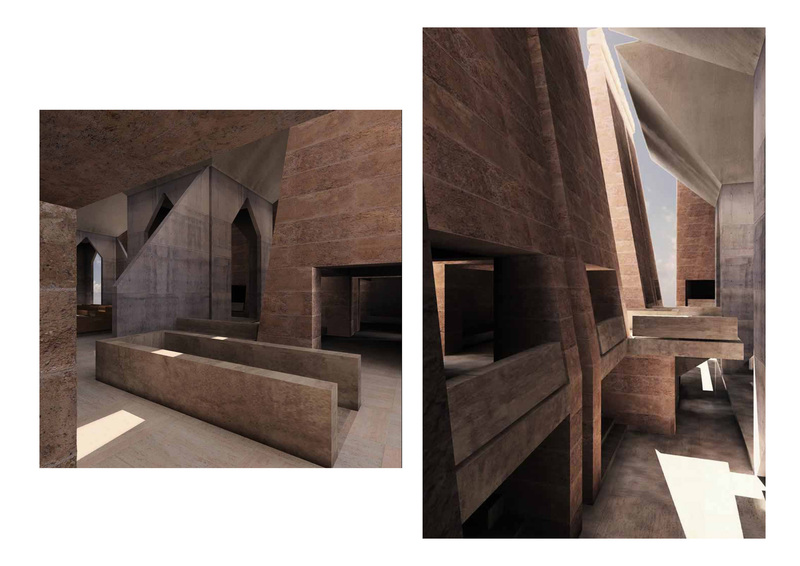 This entry was posted in Architecture, Jerusalem, Synagogue and tagged architecture, architecture modeling, Hurva synagogue, Jewish quarter, Old City, postaweek2011, tabernacle, visualization on January 23, 2011 by Shmuel Browns.